As well as keeping your home top to toe clean, it’s important to clear-out and declutter your garden too. We can often neglect our gardens, especially during the winter and colder months or during those periods of rain and wind. A well-maintained clean and tidy garden will create a space for you to relax and unwind in. As well as cleaning out your garden and keeping on top of it’s appearance, you will want to consider which plants and flowers are suitable for each season. By doing your research you can mix and match plants and flowers to suit your style. Online blogs, TV programmes and magazines are all brilliant for inspiration. A colour scheme isn’t always essential but plants and flowers that match or clash in a positive way will really brighten up your outdoor space. You might want to consider replacing old plant pots too. The more time you spend in your garden, the less time you’ll spend for Belgrave professional cleaning. As well as relaxing in it, take some time out to clear up a bit on a regular occurrence. And during the winter months, try to avoid neglecting it altogether or else you’ll have an even bigger job or clearing it during the spring and summer. Where to start? You will need to plan your garden clear out. Gardening in general depends solely on the weather and time of day. It’s no use working on your garden during the winter on a cold and dark late afternoon. You’ll need a calm and dry spring or summers day, not too hot and certainly not wet. What do you need? You’ll need a good selection of high quality tools for cleaning and gardening. These tools are often very sharp so ensure you store them correctly and out of the way. A shed is a brilliant storage option for garden tools and equipment, or a weatherproof cupboard. There are many options depending on you and your needs. • Clear and clean your garden during the morning or early afternoon on a dry day if possible. Sometime during the spring months is probably best. • Wear the right clothes, gloves and shoes before you begin. • Ensure you have the correct tools for gardening and large bin bags as well. • Check out your local green waste collection service. • Break up your garden area by area and save a space for branches, leaves and so fourth. • Pack dry leaves in bin bags. • Sweep-up hard areas and surfaces such as concrete, paving and paths regularly. 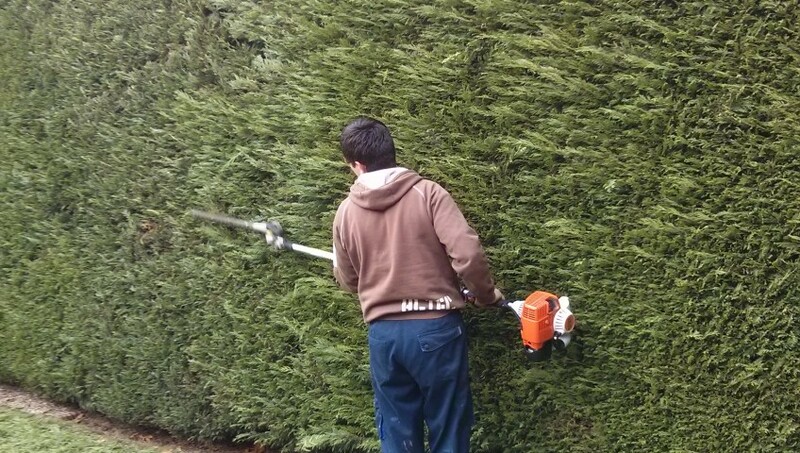 • Cut hedges and any shrubs that are overgrown. • Plant new flowers, depending on the time of year. • Give your shed or greenhouse a clean and clear out. • Rake any gravel to freshen it up. • Rake any flowerbeds to get rid of wastage and winter debris. • Set aside waste to start a compost. • Get inspired by researching into what colours are in. • Shop around for quirky garden furniture and really make it your own. • Make the most out of your garden by spending as much time in it as possible when the weather is dry. • Outdoor fairy lights and ornaments are a great finishing touch. • Even if you have a small garden or a balcony, try to keep on top of maintaining it to avoid it looking like a jungle. • Grow your own herbs, fruits and vegetables for organic cooking.